Many of my orders are of 5,000- 22,000 pieces per style. My sewing line's output is around 1,200 pieces per day. So styles are finished within 1 -2 weeks and need to change style. In the first week of loading a style operators are not familiar with style and they learn in this period. So the time measurement is not correct to be a reference. Then in second week reference can be measured accurately but almost the styles get finished. How can I set the target and bonus more adequate in this situation? Bonus amount should be attractive to workers and also fair to factory. Workers work on hourly wage. The problem raised in this question is a fact of garment manufacturing factories. When a new style is loaded to a line, operators learn on initials day and produce less. That is one of the reasons for low production compared to pick production or average daily production. In this article I will explain how you can set production target and operator bonus effectively even on the initial days of the production start. You might already know the formula that is used to calculate daily production target of a style. If don’t know here it is. There are two problems in using this formula calculating production target on the learning stage. You wouldn't know actual line efficiency – as efficiency will build up day by day up to pick efficiency level. And without past data you can’t assess what would be the efficiency of day 1, day 2 or day 3. Product SAM - assuming that you are not using Predetermined Motion Time System (PMTS) for measuring product SAM. Production capacity is estimated based on time study of the production line. This has been indicated in the question. The only solution of this problem is that you have to develop database for line efficiency at the learning stage. This period is called as learning curve. Develop learning curve of your lines (style wise, order wise) by studying styles. Measure the trend - how production build up happen and reach to pick production day by day at the learning stage. Once you have enough data on efficiency build up (learning curve) you can make target plan for the future orders. Learning curve may vary depending on order quantity and style difficulty level. Learning curve (Efficiency% Vs Days) of a typical garment factory for one style is shown in the following Fig. 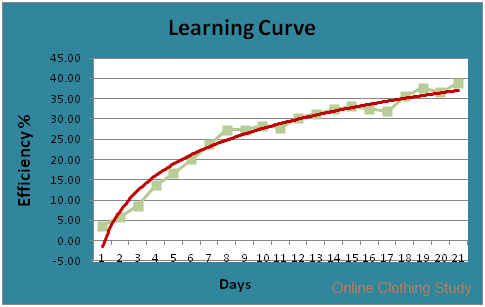 In this learning curve day wise efficiency build up is shown. Similarly develop database for standard time for your styles by using Time Study method. Now you have both data to calculate production target even at the learning stage. Practice it and write me if find any issue in using the above method. How to Set Worker Bonus? You can set workers performance bonus at the learning stage for individual worker or/and for the group without much difficulty. It is the similar method that you use calculating bonus amount on the normal production days. The difference is - in this period the target efficiency% for becoming eligible for earning bonus to be kept lower than normal production. Design day wise target efficiency based on your learning curve. You can keep the bonus amount per point increment of efficiency same. Or slightly more to motivate your operators working harder. Online Clothing Study: How to Calculate Production Target and Worker’s Bonus on Initial Days of Production Start? Method of calculating production target.